Christmas celebrated on December 25th is one of the most best times of the year. Symbols associated with Christmas will have different meanings to different people. People who celebrate this festival symbolize it to family, light, happiness and taking it easy. The solstice symbolism shows that things might be tough in life and more obstacles might be there on the road. But at the end of the tunnel, there is always a shining light. While the December month of the year can symbolize many different things, there are many concrete symbols associated with Christmas exclusively. Let’s take a look at the different symbols associated with Christmas. The first, and perhaps most obvious, symbol of Christmas is the Christmas tree. Fir trees retain their plush green color even in the cold winter months. They can survive any degree of harsh conditions, showing us that if we remain optimistic, we can also survive tough times. If they were not cut down to fit inside houses, they would grow to great heights, symbolizing growth and victory. Christmas trees also come with pine cones, which are symbolic in their own right. These cones were believed to predict the weather, as they would open up on sunny days and close before rainfall. 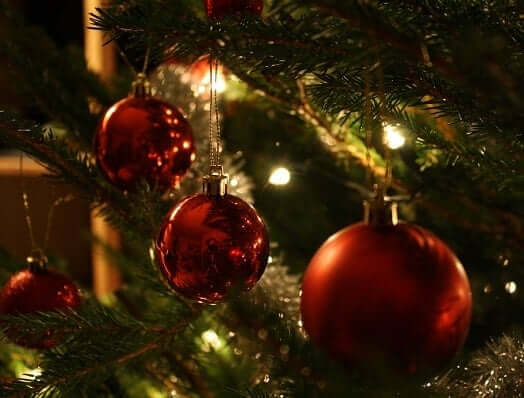 Combined with its beautiful color and great physical presence, all of the physical traits of the Christmas tree serve to energize our spirits and provide us with joy during the seemingly less-than-joyful season. The ash tree is also symbolically used in Christmas as the “Yule log”. With its traditionally-accepted protective qualities, this ash tree is used to warm families during this holiday season. Traditionally, a Yule log would be saved from the previous winter and be added to the current fire to symbolize the continuity of life through cycles. Additionally, the duration that the log burned during this time was traditionally interpreted as an indication of how long festivities would last. Almost equally prevalent during this festive season are wreaths made of holly and ivy. As with other circular shapes, wreaths speak of infinity, inclusion, and cycles, such as the cyclical nature of the year and its seasons. Circles show an unbreakable bond, and this idea can be applied to any relationship: friendship, nature, romantic, family, or religious beliefs. In the Christian faith, the circular wreath can also be considered symbolic of the crown of Christ, who claims Christmas as his birthday. For the romantics out there, we mustn’t forget the Christmas symbolism of mistletoe. Although most people recognize it as a plant to be kissed under, mistletoe’s symbolism goes a bit deeper. It hangs alone in the air, making it a sign of freedom – it does not need to be tied down to survive. Mistletoe also chooses a mighty vessel in which to make its home: the great oak tree. Because of the size of this tree, mistletoe can spread and grow endlessly. So where does the tradition of kissing come from? This plant was internationally recognized as a symbol of peace – perhaps a handshake would be more appropriate? Mistletoe was used as a sign of surrender. Thus, we know kiss in remembrance of that. Another popular Christmas symbol and object to see during the holiday season is a bundle of bells. These have obvious implications: clarity and joy. Bells ring and trigger our mental clarity, which may be pretty cloudy during the cold and dark winter. Bells are used in various religious ceremonies, as well. In Christianity, for example, bells signify the presence of Christ while Buddhists use it to realize and respect the gift of higher wisdom. There are many other symbols of Christmas – angels, stars, reindeer, Santa, gifts, bows – the list can go on forever. As with all symbols, the same rule applies to Christmas: there are no rules. What the holiday means to you is for you to decide only. What objects, animals, or plants speak to you during this time of year? What help to get you out of the winter runt and excited for the new year? There is no right or wrong answer.